I was rummaging around in the basement this morning and came across my box of old journals. Picking up one from 1996, I laughed at my horrible poetry, ridiculously obsessive crushes and newspaper clippings I obviously saved because I thought they were important (they're not). Then, I found the most amazing thing. 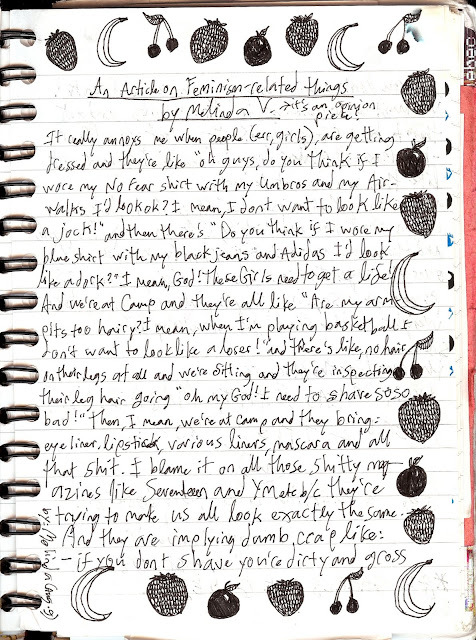 It's a little two-page statement piece, written by a girl I shared a cabin with at camp. We were all either 13 or 14 years old at the time and the concept of feminism probably wasn't a preferred topic for fire-side marshmallow-roasting conversations. 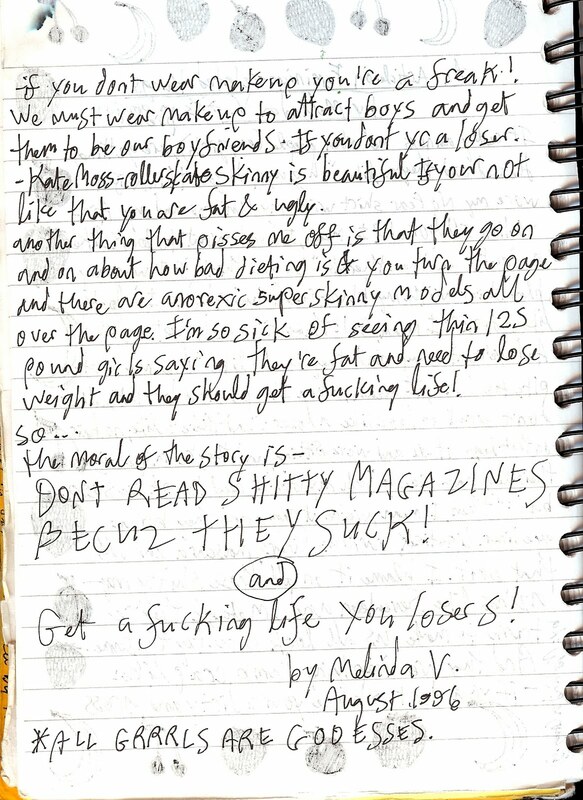 The fact that Melinda (thank goodness she wrote her name down) had the lady-balls to write these things while attending a prissy-pants camp (no hating, but it was) makes her just about the coolest 13/14 year old gal EVER. Rather than type her message, I thought I'd scan it instead. I mean, look at her artwork! She spelt girls like grrrrls!! At FOURTEEN (or thirteen)! I want to travel back in time and get her to write down her last name so that I'd be able to track her down on Facebook or something and tell her just how cool she was as a kid. If only I could meet teen girls now with such a solid perspective on life! Plus, I'm seriously curious to see what she's doing now. ps. How awesome is it that she references Airwalks? I came across old letters that my friends and I had passed in junior high and high school a while back. I had a blast looking through them. facebook?? FIND HER! LOVE HER! Heather - Every time I think about throwing old letters away, I end up just throwing them back in a box...and thank goodness for that! They're so great to go through every once in a while. Even if the poetry really IS bad ;). Vittoria - I had a suspicion you'd dig this girl! Ha! !